This is my blog. Sometimes I eat 19 meals a week. Sometimes I eat more than 19 and people have to buy them for me because apparently people don't eat 3 meals a day 7 days a week. There will probably be pictures of these meals only because I named my blog ieat19meals and I don't know how to change the name anymore. I will also probably use the same pictures because there is not a lot of food at the Met and I eat the same thing every week. And I also don't know how to take good pictures. Today I ate half of a chicken calzone, some bad california roll pieces, pizza, maybe. I don't really remember. Then I think I had some soup and fun noodles. And I just spit out my second piece of gum. 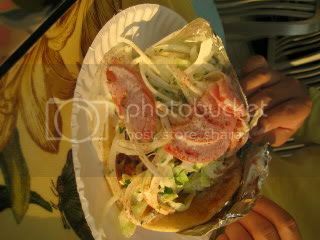 But I didn't take any pictures because I decided to make this blog 20 minutes ago, so here are some pictures of food that I am thinking of right now and have searched for extensively using google images and flickr. 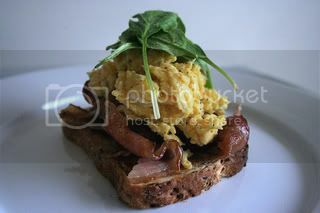 These are some fancy scrambled eggs on toast with spinach and bacon, which is god's gift to man. I set it as my desktop background. 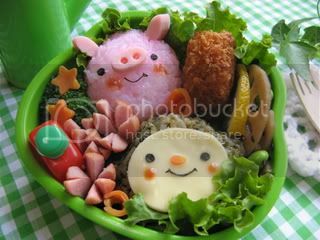 I think it's really popular to have bento boxes with smiling animals. I was debating between this one and a Pikachu one. They're so cute and I don't know if I could eat them. Maybe if I was blind I would. Actually, I would probably eat them if they came with my meal plan. I just found this picture on my photobucket account and almost had a heart attack. This is a gyro from some place in New York.